This post contains affiliate links. Please see my disclosure page. It never hurts to be prepared for ... whatever. Some people think it's silly, that nothing will ever happen to them, but others say "I'm prepared to be wrong." Which are you? And let's face it, the power can go out anywhere, any time, no matter where you live. I'm sure every single one of us has been without power at some time in our lives, whether it was for five minutes, five hours, or maybe even five days. If you haven't read my post about my power's out kit, why not go take a look? I'll wait, I promise. Our power goes out rather regularly, usually just for a few minutes, but we've had several that were longer. Besides the mysterious outages - the ones where we never know what caused it - we've also had a cat on our transformer, a vulture on a transformer, and a blown transformer. All required the power company to send out a truck and a crew to replace the transformers. Ice, snow and wind storms have knocked out our power on other occasions. When I put together our kit I wrote down three meals a day for three days, plus snacks. 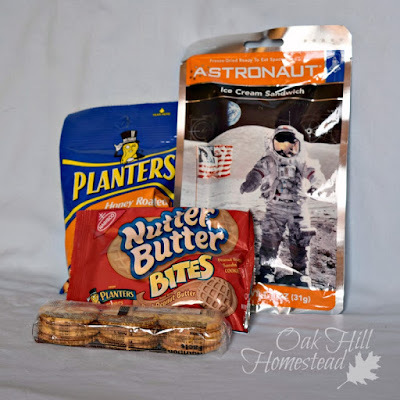 I wanted canned items that were quick and easy to heat and eat. I included canned fruits as well as vegetables because fruits don't require heating. The juice left after draining the fruit is also delicious to drink. I wasn't too worried about our caloric intake and perfectly-balanced meals because this is only meant to last three days if needed. If a situation continues past three days, we'd need to be more conscious about long-term nutrition; we'd also have thawing food in the freezer that would need to be used up quickly. 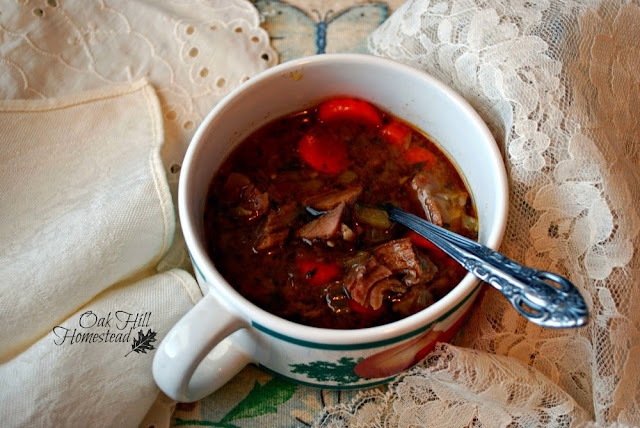 Idea: pressure-can a batch of homemade beef and barley soup. Canned chunky-type soups make a good lunch meal, especially if you have bread or crackers to go with them. (For ideas, see this list of soup recipes.) Canned chili and similar meals are another good choice. If you have chickens on your homestead you'll probably have eggs, and if you have a cow or goats in milk, you'll have the morning's milk to put on cereal or in your coffee. For dinner, I chose canned beef stew and canned chicken and dumplings. An additional can of beef chunks helps to stretch the stew, and a can of chicken stretches the chicken and dumplings. If you have a large family, simply buy more cans. These can be heated up in a few minutes on a campstove or other heating source. Since I first made our power's out kit we've been transitioning away from eating prepared, processed food, so I'm in the process of replacing these canned items with home-canned versions. Commercially canned food is a good way to begin though. 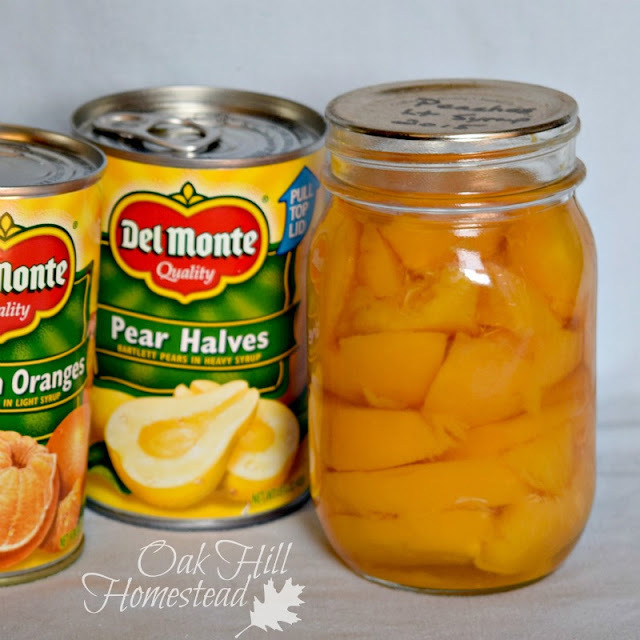 Get your kit together and replace items with home-canned or healthier versions when you can. If you've gathered the supplies to make a DIY straw box cooker, you can use what you have on hand to make dinner with a minimum amount of fuel. Suggested snacks: Fruit (fresh or canned), pretzels, canned nuts, granola bars, pudding cups, homemade fruit roll-ups, freeze-dried ice cream and other camping-type foods. *Here's how to make your own instant oatmeal from Don't Waste the Crumbs. Of course you would boil water to add to the bowl and then let it rest until the oatmeal thickens. For longer shelf life, store in small Mason jars that you've vacuum-sealed instead of plastic zipper bags. 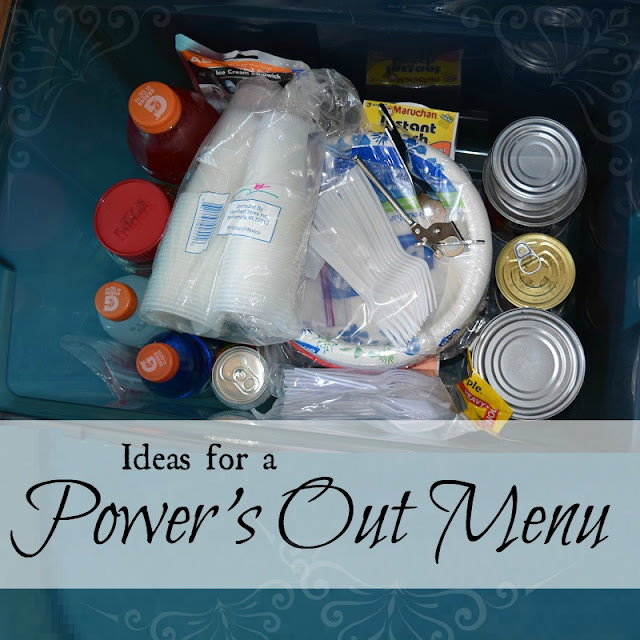 What foods would you pack in your power's out kit? These are great points! I need to have a kit like this handy for our next outage. I have to constantly remind all of my kids NOT to open the fridge when the power goes out so we don't lose the cold air. Jamie, could you put a piece of duct tape on the door to "keep it closed" and remind them? I've been eager to see this post. Thanks for sharing! I hope it's helpful in jumpstarting your kit too! Great post. Great idea. Thanks for sharing. Oh I love this! We live in a very small town in farm country and I myself never thought of plans like this until I moved here last year. My husband though-- is always prepared although not like this. This is definitely sparking my ideas. I'm saw glad I clicked on this when I saw it. It never hurts to be prepared, Maria. I'm glad that this post made you think and I hope it gets you started! This is a great idea! I'm going to have to make up a kit for my family. I'm glad it was helpful, Jacquelyn. Good for you for making a kit! Sharing this post, Kathi! Power outages seem to be happening a lot everywhere these days and this is a really helpful menu. Thank you for being a part of the Hearth and Soul Hop. It never hurts to be prepared! Thank you for sharing the post, April. If you have a gas BBQ at home you can always use that to cook that thawed meat from the freezer, fry eggs or baked beans and grill Vegetables from the garden. Or with the use of a camp oven make dampercwhich is just a type of basic bread to go with soup or canned tuna. Great Idea...living in a hurricane prone area, we always have to keep a good supply of this type of meals ready to go. We just had a fairly long power cut during storms at the weekend here, and it made me realise we had used up a lot of our emergency food storage in winter. I like your idea of pressure canning some meals- I do not have a pressure canner yet, but it is something I would like to aim for. Thank you for sharing! Hi Gwen. It can be easy to eat up those supplies, can't it? Good for you for realizing it. I use a Presto pressure canner and am very happy with it, by the way. It wasn't too expensive so it didn't take too long to save up for it.